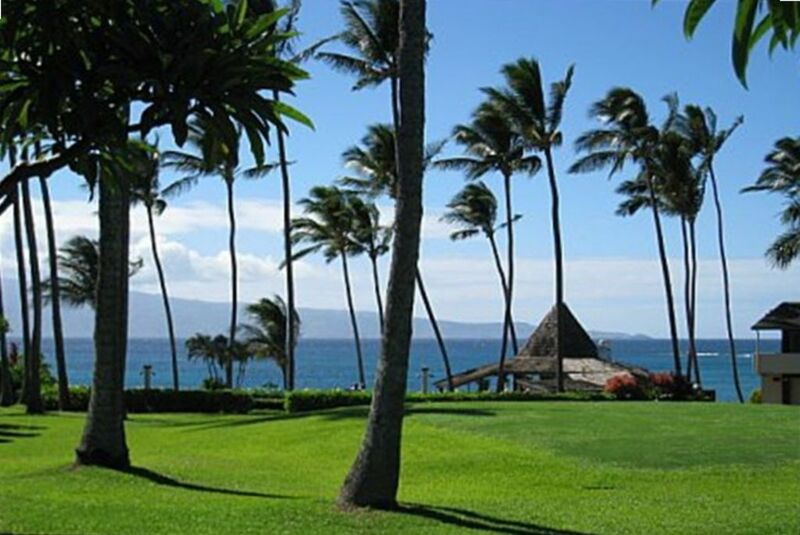 Napili Shores Resort G155: Maui Magic! Home away from home in a location unlike any other! A one-of-a-kind unit, this ground floor, non-smoking, ocean view studio will provide the relaxation you're looking for. Watch the surf while you sip your complimentary morning coffee. After a full day of swimming, snorkeling, golfing, shopping, or whatever suits your fancy, just sit back and relax in the calming atmosphere of Napili Shores Resort, where no buildings are higher than the palm trees! Step out onto the lanai for a spectacular ocean view, a few steps further and you're right at the water's edge. Swim or snorkel in calm Napili Bay or roast yourself on the beautiful white crescent beach. Napili Shores Resort offers two pools (one oceanfront), jacuzzi, gas grills, two restaurants on property, full-time concierge, and laundry facilities. New kitchen design features cherry wood cabinets and granite counter tops. All new appliances include refrigerator with icemaker, dishwasher, and glass top range with built-in overhead microwave. New design maximizes efficiency and counter space with dining peninsula. Bathroom has also been totally redesigned - all new fixtures with tile and tumbled onyx walk-in shower. Cabinets and countertops are same cherry wood and granite as in kitchen. The “all new” theme continues with tile flooring and furnishings: king-size bed, desk, chair and ottoman, and flat-screen TV. High-speed wireless internet access will let you stay in touch with home. Weekly maid service and beach towels also provided. Very private setting, yet easily accessible. My son and I had a very relaxing time. The studio was very clean, decor was very nice and up to date. Could use a few more kitchen supplies/pots/pans. Great location. Staff was very nice an accommodating. Owner very responsive and friendly. Highly reccomend this studio for a couple. We had to rent chairs and umbrellas, would have been nice to have in the studio already. Great time, look forward to our next visit. We had a wonderful stay at this studio apartment in Napili Shores. Located on the ground floor, you can walk straight out to the communal green area but there is still privacy when sitting on the lanai. The kitchen was excellent, very well equipped. We cooked every night and there was every utensil necessary. The bathroom is large and renovated. The sleeping area was very comfortable with plenty of pillows. Our host was fantastic- touched based before we arrived and when we got there. Any questions we had, she replied straight away. Would highly recommend this studio if you are visiting the Napili Bay Area. We will be back! We found that our stay at this unit was the best of our 4 times staying at Napili Shores. The unit was beautifully updated and comfortable. The owner was easy to work with and replied to any questions quickly. The kitchen was well supplied, towels provided and other supplies met our needs. The view was close to being ocean front, we could see whales and dolphins with binoculars while eating breakfast on the lanai . We hope to stay in the same unit in the future, if available, during our travel plans.Thanks again Susan for your hospitality. Comfortable. Loved the beach within walking distance. Absolutely loved this studio. The location was perfect and amenities just what we needed. Check in was quick and easy. There was always easy parking. I loved being able to walk right out onto a large lawn that is steps to the beach. As a note, the very popular Gazebo restaurant is on the property. Good if you want to go there but the constant line up from 7 am to 2 pm make the front pool unusable given the constant chatter and gawking of the 30 people waiting in line. Overall a beautiful property and quaint studio. Really good value for money. Perfect if you like peace and quiet. We will be back for sure. It was a beautiful property. Clean and well maintained. It has all the amenities needed to enjoy the beach and other activities. Spacious room spacious bathroom. Very comfortable bed. All the utensils, crockery and cutlery needed were available in the kitchen. The picture here actually is an exact view from the patio.